The tiled wall and the brass light fixtures add an exotic note to this quietly daring kitchen. If pressed to characterize it, I'd go with 'middle-eastern meets modern'—a description that echoes the transformative events unfolding half a world away. Let's hope for as peaceful a resolution to those scenarios as is found in this open, bright and forward-looking design. 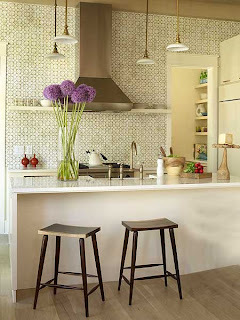 I just love this kitchen... It's so simple yet charming. It's inspiring to see how relatively few elements have been combined to create such an effective composition, isn't it, Branislav?